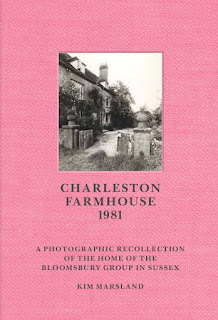 Charleston Farmhouse was the home is known as the home to the Bloomsbury Group. It was the home of Vanessa Bell and Duncan Grant and it was decorated by them and their friends with frescos and sculptures. The Farmhouse is now owned by a Charitable Trust and it has been restored and opened to the public. This book, by Kim Marsland, is a record of how the house and grounds looked in 1981; before the restoration. It is very much a snapshot in time. This is not a large book and it is beautifully constructed with cloth binding and those thick paper pages that you rarely experience these days. It feels like a book with heart and not something that you would read and discard. There is a care in how it looks that matters. It is largely photographs as it documents the visits of Kim Marsland to the Farmhouse when she was a student. The opening pages describe with great beauty her first sight of the farmhouse. Her words paint a delicate and sensitive picture of her experience of the Farmhouse. This is not a book lamenting the restoration of the Farmhouse, far from it, Kim clearly delights in the care that has been taken to restore the Farmhouse and its gardens to its heyday. This is a book that deliberately records a moment in the Farmhouse's history. It is a set point in time and a moment that matters as much to the story of the Bloomsbury Group and its houses as does the preceding and consequent years. I really liked this book. In its own right as a photographic record it reaches that part of me that loves photography. It also will be of great interest to people interested in the Bloomsbury Group. I check the calendar carefully before making the next statement as I wonder if it is too soon to mention the C word, but if you know someone who might like this book then Christmas is not really that far away. For the sake of transparency I was sent a review copy of this book. Thank you for sharing this book! I had never heard of it and will definitely seek it out.